I returned from Rollercon on Saturday. The annual meeting, skatefest, partying etc was overpowering this year. I believe there were somewhere near 2500 in attendance but don’t really know. There were participants from all over the US, Canada, Australia, New Zealand, UK, Germany and more, including South America. There is a difference. Amongst all the fun more women (and now men) are becoming even more serious athletes. Many of the leagues are tightening up on fundamentals and other aspects. Chicago, for example, has a Haymarket league for those who aren’t quite good enough to be in the Windy City Rollers. They skate an additional 18-week program to see if they will qualify. And there are an additional 150 (!) skaters who are in preliminary training (called “fresh meat”). One reason this fastest growing women’s sport in the world has remained a subculture is that all leagues are owned by the participants and are independent. Over 70 of the 570 leagues are affiliated with the WFTDA for rules and other standards. There is also an organization for one aspect of banked track skating, and another for old style banked track skating. There are organizations in the UK, Canada, Australia, etc. And this is all about a fully legitimate competitive game that grows in popularity. I cannot generalize on the players. I met a wonderful woman from Bremen, Germany, who had a bit of an Ingrid Bergman look who is an air controller (“I was off during the first volcano explosion in Iceland, but was on hand for the second). There were teachers, pathologists, copy editors (“I make certain Roller Derby gets coverage in my newspaper”), and you name it. There were mothers and daughters, grandmothers, students all of whom were so interesting. I had a little problem with all the tattoos (not on everyone), but that is me and my generation. There was constant training and skating scrimmages so the different areas and styles all meshed. I headed a seminar on how to promote and “grow” the sport, but couldn’t have done it without the help of Val Capone, Mildred Fierce, and others. I probably learned as much as they did. 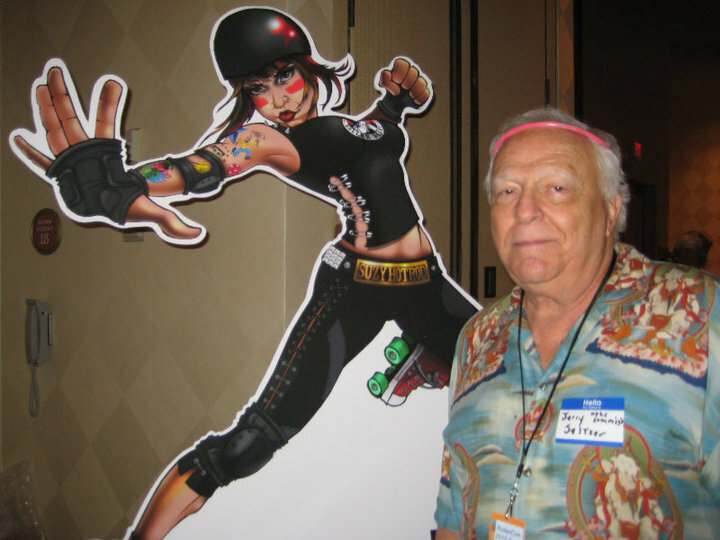 More people than not didn’t know that Roller Derby has such a rich history. Most thought the game started when the Roller Girls started and were shocked to hear that it is approaching its 75th anniversary. Also, a great number of the new leagues starting up do not know how to promote or present their events and that’s where I think the seminars were helpful. I hope if anyone took notes during mine will post them to facebook (Mine had the largest attendance of any at Rollercon, so there). The growth will not stop and I will be working with a number of the cities and personnel to see how the game can go to the next level for those who want to participate. Several are being approached now to go into larger venues and the next logical step is a super leagues of the existing leagues. I suggested and Grace Killy, the president of the WFTDA agreed, that regions should form their teams into a league, so that when they play each other they can post league standings and scores….each game now just stands on its own except for the national rankings of the WFTDA. What makes it difficult is there is no super governing body or organization that can negotiate in terms of national advertising, television, merchandise and more for the benefit and revenue of all the leagues. I don’t think anyone is aware of the sacrifices these women make in training to skate, volunteering for their matches and community events, and yet having to pay a fee every month to belong. There were approximately 30 booths of merchandise at the main hall at the Las Vegas Sports Center, which shows that those who have chosen to affiliate with Roller Derby realize the revenue that can be achieved. I would like to work in the future with these wonderful women in creating a national revenue stream that will allow the sport its natural progression without the heavy burden on the wives, mothers, students, and others who have made this unbelievable phoenix rise from the ashes of its almost 40-year demise. This is on July 22, 2012. in a day and a half we are driving to Las Vegas to the Riviera…..see us in the GoMerch/seltzer brand booth #61…..to get a preview, go to http://www.seltzerbrand.com. And I think there’s less of a need for a big central organization to manage national attention. Back in the 50s, there were three national TV channels. Now there are hundreds, and the internet makes it easy to watch whatever video you want, including live streams. I can go and watch derby games being played in Australia on Derby News Network. At the same time, I’d love to see some more regional organizations forming as, at least in some regions, the whole notion of intraleague play is going away and being replaced by games between B-teams and C-teams of neighboring leagues. These teams are never going to compete at a national level, but there’s a good potential for more local competition and local rivalries that bring in the fans, which might be helped if there was a bit more organization at the local level rather than just having each pair of leagues try to schedule bouts with each other independently. I don’t think there should be a national organization to manage all leagues, but there should be some vehicle capable of giving a unified approach to the growth of the game. The problem with games with teams of lower caliber is you will end up with even more 280 to 40 scores and that means you are creating boring matches for the audience…..whatever can be done to assure more equal competition should be pursued. Jerry, it isn’t so much lower caliber teams that make for scores like that, it’s teams of mismatched calibers going against one another. Do you want to make it so a so-so team can’t play at all? How are they ever to improve? WFTDA currently has 89 member leagues, and 52 apprentice leagues. (who are likely to become full members over the next year). I can imagine that as that growth continues there may come a need for some sort of divisioning. As with in college sports and pro baseball. Even in WFTDA, nobody HAS TO play anyone they don’t want to (outside of tournaments, anyways). Which in theory avoids too many match-ups that go like the traditional Thanksgiving Cowboys/Lions mismatch. They have to play two sanctioned bouts in their region if they want to want to qualify for “Big Five” tournaments (and finish top 10 in their region). As in your day (but different), we’re not working like a minor/major league sport. We get our venues when those guys don’t need ’em. Or when there’s no convention, trade show, dog show, concert or home electronics sale there that weekend. We have a ten month season, and at most play one or two home games a month. We’re unlikely to ever be their primary tenant. To get the ideal opponents, you have to arrange things well in advance. If everyone has their schedules in December or January, you can’t wait till April to book June or you’ll get “whoever.” Either team might lose key skaters to injuries/pregnancy, pick up the three best skaters from a neighboring league, or recruit a 13 time world champ speed skater. All three of those things happened in the last year to WFTDA leagues, the first one to mine. If my league’s travel team were ranked 20th within the region, 18-22 probably give us a good match. Maybe 17-19 if we’re ambitious. Or 23 or 24 for the home opener (less risk of an upset). Your in control of knowing how to put things in writting I also as you know was very excited to be at this years . Roller Con gets better each year. This is my 6th year being with this group of ladies.Look how far they have gone since you & I were honored to be at there very first Roller Con here in LasVegas. I also meet so many wonderful ladies who were all very interested in knowing the derby history. I gave out about 50 dvds to many to show them some of the derby history of the past. With the interest many had to learn and keep this a sport, it was a sight to be seen with all the excitement with there training, getting to skate against many other women from all over the world. I have gotten lots of emails address to keep these gals in a question & answer about the furture of this sport. My Interest was to give them lots of praise for the great job in seeing how this has taken off in a short time. These skaters from the beginning are now there teachers for the future. Lots of new things will be coming out of these girls leagues. Writting books, doing TV adds,training younger children to make sure there will be a future in the growing of there sport. Seeing the men also learning this trade will make it another interesting sport having coed leagues. There is now 13 bank tracks all across the country and more are planning on have some built. Many like to skate flat track also.Like I had said there is a place for everyone in the sport of Roller Derby. Jerry You were the bell of the ball, seeing these pictures I am sorry I didn’t stick around for the night time events .Looking forward to seeing another year of this with many more new things in store for these ladies. My best to many who want to learn. By the way, Suzy Hotrod is an amazing jammer who skates with the 2008 Champions Gotham Girls Roller Derby travel team, as well as their league/home team the Queens of Pain. She also owns a derby skate shop in Astoria called Five Strides Skate Shop. Bonnie Thunders of Gotham Girls owns 5 Stride Skate Shop. Go there right now and buy your skates.